For years, 10-year-old Savannah Chavez of Durango begged her parents for a real Christmas tree. 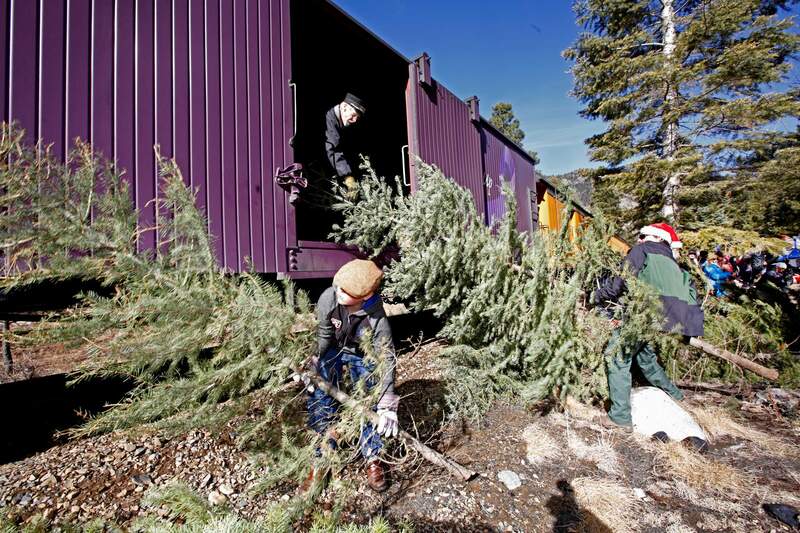 On Saturday, she got her wish as the Durango & Silverton Narrow Gauge Railroad’s second annual Christmas tree train expedition carried passengers to Cascade Canyon to harvest their own trees for the holidays. “We’ve just always had fake ones, but this might be a new tradition,” said Savannah’s mother, Jackie Chavez, of Durango. “And I think we scored,” added Jeremiah Chavez, Savannah’s father, as he held a freshly felled white fir upright on the train tracks. For the second year, the D&SNGR partnered with the San Juan Mountains Association to give tourists and locals a bit more of an immersive experience in selecting their Christmas trees, as well as clear hazardous fuel from the San Juan National Forest. San Juan Mountains Association reported 34 permits sold so far, which are purchased for $8 in addition to train fare. “We try to stick to around 30 permits each day, for logistical reasons and also to keep this excursion sustainable,” said Luke Prince of D&SNGR. The first Christmas tree train of the season – there will be five additional trips on Sunday and on the next two weekends – was close to capacity just before 10 a.m. Saturday as it left the station. “The Polar Express” wound through and above rock gorges overlooking a low-flowing Animas River, rolling to a halt in a heavily wooded alpine grove with sparse patches of snow. Passengers disembarked, handsaws were passed around and quickly the brisk post-Thanksgiving air was filled with shouts of “timber!” as trees toppled. The Welches drove nine hours from Hobbs, New Mexico, to make this year’s Christmas tree a family event. “My mom heard about this through Facebook and thought it would be a fun family outing,” said Brandon Welch as he sawed through the base of a healthy fir. He and his brothers, Justin and Tyler – triplets – traveled to Durango with their parents, James and Misti. Kate Lucas of Denver said she heard through the grapevine about the Christmas tree train and decided to buy tickets for herself and her boyfriend, Laird Horigan, as a late birthday present to him. “He likes trains and Christmas, so it was a good gift,” Lucas said. While tree-cutters sucked on candy canes and sipped hot cocoa, U.S. Forest Service officials loaded piles of pungent green boughs into the front boxcar. Matt Janowiak, ranger for the Columbine Ranger District, said the ritual began after the train’s owners asked if a trip into the San Juans to cut Christmas trees was a feasible endeavor. The Forest Service took a crew car up the tracks and found a thick population of white firs fitting for holiday trees. Furthermore, thinning the understory would reduce wildfire risk. And, other passengers said, for the experience and benefits to the national forest, the cost is a good value. Permits are on sale at San Juan National Forest offices. Christmas tree train Durango & Silverton Narrow Gauge Railroad’s second annual Christmas tree train. Durango & Silverton Narrow Gauge Railroad’s second annual Christmas tree train. 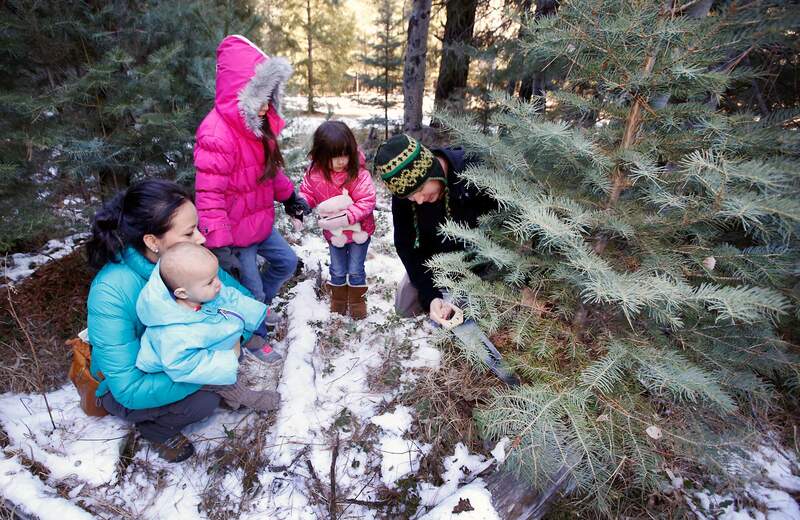 David Burke cuts down the family Christmas tree on Saturday as Carmen, holding their son, Sage, 1, and daughters, Hailey, 7, and Carmen, 4, look on during the Durango & Silverton Narrow Gauge Railroad Christmas Tree Train. The train dropped off people with about 30 tree-cutting permits near the Cascade Y north of Durango. Joe Weigman, 11, and Matt Janowiak hand Christmas trees up to George Nelson in a boxcar on the Durango & Silverton Narrow Gauge Railroad Christmas Tree Train.